It seems that just last week I was talking about the lengths in which Liam Neeson takes to prove his badassness, how he uses his credibility as an actor to up the quality of what would otherwise be B-movie action thrillers and how he sometimes uses his new reputation to his advantage (such as luring folks into A Walk Among the Tombstones which is more noir than pulp). In the wake of such power it seems he's started a trend. I discussed this when Kevin Costner (so desperately seeming) tried to replicate this kind of success earlier this year with 3 Days To Kill, while folks such as Tom Cruise and Guy Pearce have completed a version of these excursions in hopes of carving out their own character with a particular set of skills. 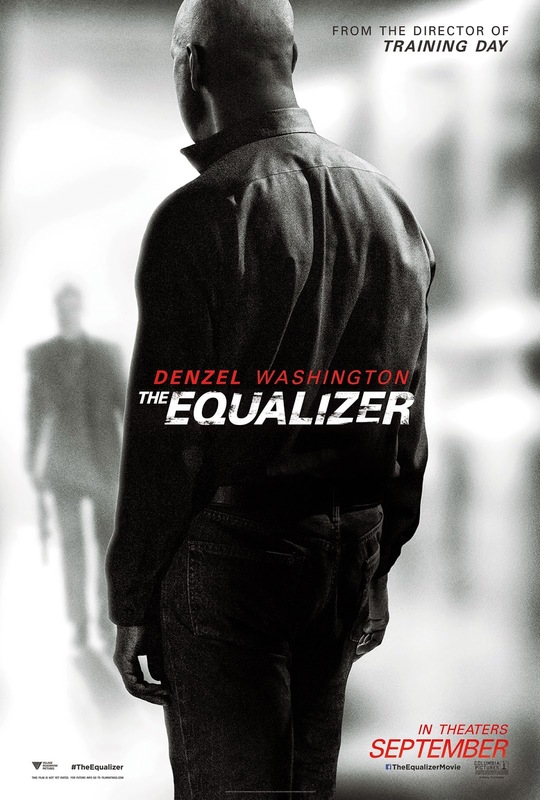 All of this is to say that Denzel Washington didn't necessarily need a character of his own (much less one that he resurrected from an 80's television show) but it wouldn't hurt to try and so he did and so we have the feature film version of The Equalizer. On that note, this is a movie made in a manner that is extremely content with itself; from the marketing (those horribly plain posters) to the over-used slow motion and standard score (seriously, this soundtrack is pretty awful) and it clearly feels very little need to be more than this because it has Mr. Washington at the center of it and his presence alone garners it all the dignity and solemnity it needs to be taken more seriously than it actually is. Having said all of that, I rather enjoyed myself in the slow paced, but precise thriller that allows Washington to develop a more singular character than he has since maybe Frank Lucas. That isn't to dismiss the work he has done in between (he certainly deserved his nomination for Flight), but we all watch a Denzel Washington movie to see Denzel Washington and while he still plays that card to good effect here he also isn't the typically charismatic, well-rounded human being we are accustomed to seeing him portray. He is a man supposedly cut off from emotion or sentimentality, but who can't help but feel if he has the power to do something right, he should do it. No, The Equalizer isn't a great film, but like so many Liam Neeson and Tom Cruise features it does what it's supposed to do and it does it well enough that we'll take the sequel with open arms when it comes around. Teri (Chloe Grace Moretz) and Robert (Denzel Washington) take a stroll. Based on what apparently was a TV series than ran from 1985 to 1989 for four seasons the new film follows retired intelligence agent Robert McCall (Washington) as he utilizes his well-honed skills to right the wrongs in the world around him. I, clearly, have no point of reference to how much the new film owes to the original series, but like any of these films or shows that fit into the action/thriller genre you know what you're getting into here. The only difference that comes around is whatever unique quirk they can come up with for the title character to possess that sets them apart from all the other crime-fighting characters out there doing the dirty work. In the case of McCall it seems to be his precision. Washington maintains his non-empathetic glaze throughout the entire (overly long) running time of the film, but it is more than just McCall's mannerisms that are automatic and executed without second guessing but everything in his world. He has retired to a small corner of Boston working his strict forty-hour weeks at a Home Depot like store. He goes home to a simple apartment, to have a simple dinner, but rather than retire to bed he goes down to a corner cafe, takes a corner booth where he precisely sets up his table to take his tea and dives into a good book. Here, he meets Teri (Chloë Grace Moretz), a young prostitute who happens to be under the control of Russian gangsters who beat her up and put her in the ICU after a night at work where she doesn't please the customer to his liking. Not being able to stand idly by Robert knowingly gets himself in deeper than he probably should at this point in his life and takes out his sense of justice on the local-level Russians. This naturally leads to reinforcements being sent in by the head of the snake and thus we meet Teddy (Martin Csokas) a sociopath who will stop at nothing to delete from the grid this reawakened do-gooder who has the audacity to stand up for the helpless. Hinting that there might be more to this re-make of an old TV show than the pure motive of a cash grab or to start a franchise with the almost sixty year-old Washington is a quote from Mark Twain that opens the film. "The two most important days in your life are the day you are born and the day you find out why." Who knows if this actually means anything, but it certainly sets a rather ominous tone that states we might be given a journey of self-discovery or of purpose in a routine world and we rightly presume it is talking about our titular character though the saying is so broad it could certainly apply to a number of characters here. As the film goes on, at least for the first half hour or so, it is very much in line with the protagonist-calculated and exact. Then, as things naturally begin to ramp up the film takes too much time dealing with subplots that are unnecessary and make it seem oddly convenient that a man who lives such a quiet, reserved life would have as many run-ins with questionable types as he does. It is used to better define his character, but it would have been more effective if director Antoine Fuqua (Training Day) allowed only the throughline mission to be Robert's single point of focus given it is the one that he finds worthy of getting him back into the business he once swore off. Richard Wenk is credited as the sole screenwriter here and with that he has allowed Washington's McCall time to breathe, time for exposition in which we learn he works for no one, he is very matter of fact both in his day to day and during his executions, but as concentrated and focused as he is through the first act that exterior begins to crumble as the films finale builds toward a generic action routine. What begins as an interesting, somewhat depressing character study that leaps off the tone of the opening quote devolves into standard audience expectations. What Fuqua, his star and the rest of their crew have going for them is the hard R-rating the film is granted and the brutality within that rating that is explored. McCall is ruthless in his tactics using barbed wire to string up a henchman and that is only one, tame example of the lengths he goes to. What sets The Equalizer apart is that despite the plotting becoming less narrow as the film plays out the actual events happening within remain gripping. Robert McCall patiently awaits his latest victim in The Equalizer. Who are you? Everyone asks once McCall is done with his rounds of putting countless men to shame in a matter of seconds, but he is happy leaving them wanting. You could almost say the same about Washington and what his career is at present time. We know that if not every year at least every other we will get a Denzel Washington film where he uses his charm to get good guys out of bad situations or bad guys into a good situation, but he has consistently somewhat unexpectedly worked within the action genre lately when one would think an aging actor of his caliber would go for Oscar hopefuls every year. 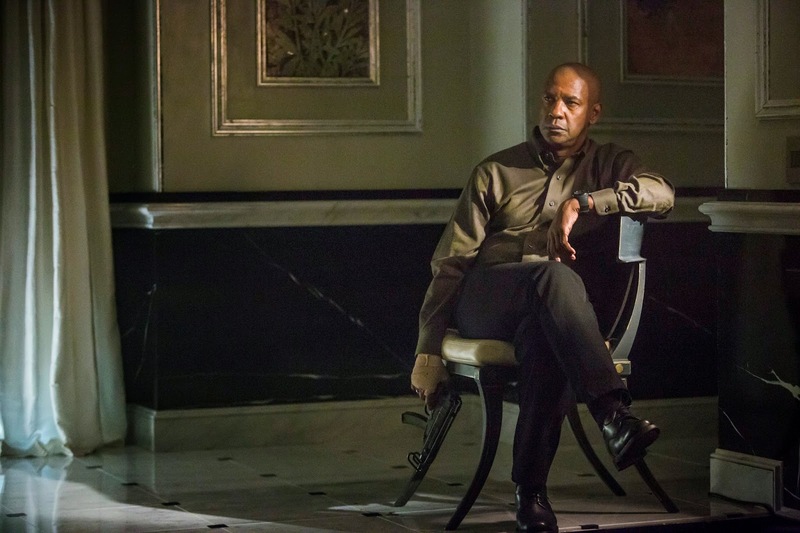 In The Equalizer though his character is required to play things safe and restrained yet Washington cannot help but to infuse his inherent charisma into the "act" that McCall must put on for his co-workers ultimately giving audiences what they desire in a film that doesn't necessarily make room for it. Though heavily relied on in the marketing scheme, Moretz is hardly a part of the film only appearing in early scenes to set-up the motivation for Washington's character. While Washington is obviously the star here and the only character that actually matters he finds a worthy opponent in Csokas who, despite playing a rather recognizable, heavily-tattooed Russian gangster with a bad attitude, becomes legitimately menacing in the actors hands. What makes him this way is Csokas ability to lean towards the unexpected. We understand Teddy is a bad guy and is willing to go to any lengths to do his job, but sitting on the edge of ones seat waiting to see what method of disposal he uses, just how far he will actually go (and for how long) is both extremely intimidating and rather transcendent of Csokas to do with such a stereotypical role. There is also the obligatory section in the film where McCall returns to his former liaisons and friends (Bill Pullman and Melissa Leo) who work in unspecified parts of the government to get the low-down on what exactly he is up against. You could argue it too is unnecessary, but it peels back a few more layers of McCall's story as well as giving actors like Pullman and Leo screen time, which is never a bad thing. Truth of the matter though is I would have preferred those layers been left for the aforementioned inevitable sequel leaving this a more stripped down, barbaric experience akin to what we were promised in that first forty-five minutes.